For storage and display, baskets comprised of wiring allow for increased accessibility and visibility. Accessibility also makes them well suited to dipping or washing processes such as ultrasonic cleaning as they are hold the items securely and allows them to drain without transfer to another container. The security of wire baskets encourages their use for lifting and sorting applications as well as batch processing. Baskets made of finer wire screens may be used as strainer or filtration devices in both homes and industrial facilities. The lattice work of wire allows for liquids to pass while trapping larger debris. Because wire baskets are so versatile, they are often made available in a number of different sizes and gauges. Important considerations include wire density, material, capacity and gap size all of which will determine the capabilities of a specific basket. Overall dimensions are likewise important and usually apply to the outer parameters, though if uncertain it is beneficial to clarify with the manufacturer prior to purchase. Custom baskets can be made to suit specific parts or batches. Baskets begin much as any other wire form. Stock metals including, but not limited to aluminum, copper, brass, steel, stainless steel are processed by a series of dies. The dies are progressively smaller and decrease the diameter of the metal until it becomes a strand of desired thickness. These wires are then woven or welded together. Interwoven or latticed wire baskets often suffice, though welding is more durable and preferred for industrial baskets. Such wire grids then undergo one or more wire forming processes. Wire cutting ensures the proper size, while wire bending determines the shape of the basket. Such operations are often performed with the assistance of CNC machining in order to ensure precision and uniformity. This is especially important for baskets designed for storage or organization applications that are often stackable in order to maximize both vertical and horizontal space. Additional features such as lids, doors or gates are created in similar fashion and adjoined using hinges. Such features as well as secondary operations such as heat treatments and coatings of plastic, nickel or chrome are commonly applied in order to enhance the physical and mechanical properties of wire baskets to further expand their capabilities. Deburring is also beneficial as cutting and bending can result in sharp edges and points. 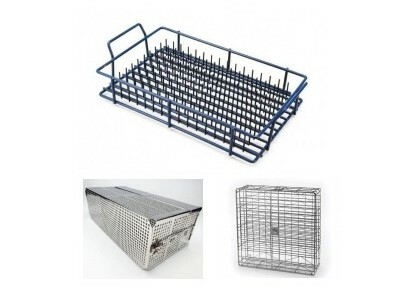 Wire Baskets Wire baskets consist of an external supporting wire cage employed in a number of commercial, domestic and industrial applications for the storage, display, organization or transportation of goods and materials.